February 14, 2015 By Elizabeth Lindemann 34 Comments / This post may contain affiliate links. Oh boy, do I love me a veggie burger. Not a fan? Let me tell you why I love them. Maybe I can change your mind. OK. Back to the deliciousness that is these veggie burgers. First of all, you can’t go for a veggie burger expecting to fulfill your craving of a regular burger. It’s NOT the same. If you are craving a burger, have one! Sometimes, you just have to have a burger. Here’s how to make an awesome simple cheeseburger. The beef kind. But, if you are looking for a hearty, tasty way to enjoy a big dose of healthy whole grains and veggies, a veggie burger is the way to go. And these quinoa, mushroom, and zucchini veggie burgers are simple, hearty, extremely nutritious and delicious. There is a secret to the perfect homemade veggie burger. I wrote about it in my last veggie burger post (wild rice and black bean burgers). Here it is… BAKE THEM! A lot of veggie burger recipes will instruct you to only fry them. When you fry veggie burgers, the inside doesn’t bind together as well, causing a mushy (albeit tasty) mess when you bite into the burger. It also means they have a greater tendency to fall apart when you reheat them if you have leftovers. These veggie burgers are fried first, THEN baked. Think of it like pan roasted chicken thighs or searing and then baking a good steak. First, you sear the burgers on both sides in a skillet (I used a Calphalon non stick skillet), then bake them on a parchment covered baking sheet to finish cooking the inside. AMAZING. The result is a solid burger with a crispy outer layer that won’t fall apart or turn to mush, and that holds up well as leftovers (in the fridge or freezer) and to any toppings you want to add to it. Speaking of toppings! My favorite part! 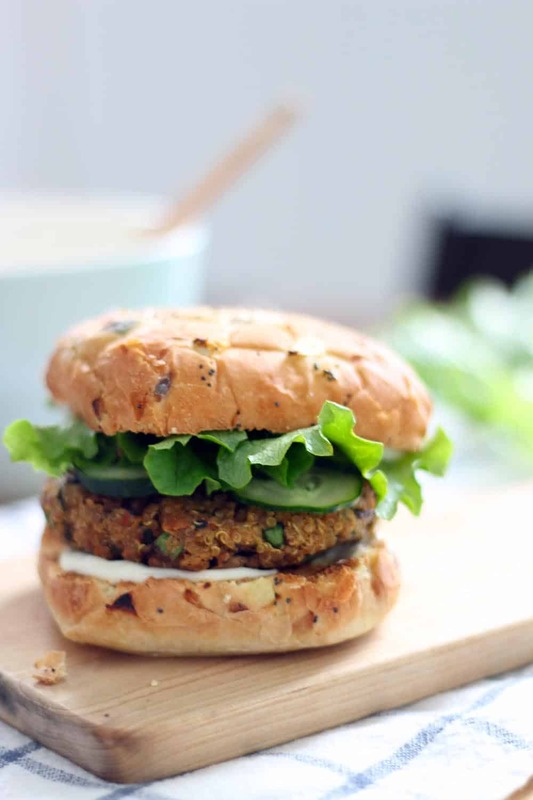 These veggie burgers taste fresh and healthy, with an earthiness from the quinoa and mushrooms and a hint of spice from the crushed red pepper. They have a more simple flavor, whereas my wild rice and black bean burgers have more of a flavor punch. I topped mine with sliced cucumber, crisp lettuce, with lemon garlic mayo (just mix mayonnaise with a minced clove of garlic and some lemon juice). DELICIOUS. The coolness of the toppings paired so well with the simple spiciness of the burger. Yummm. I’ll be honest- veggie burgers are kind of a lot of work to make. But, if you make a bunch of them, they freeze beautifully for an easy make-ahead meal, and it’s totally worth it. This recipe makes 6-8 burgers, which is perfect for just me and Zach for multiple full meals. If you have a bigger family, you may want to consider doubling the recipe so you have leftovers to freeze for another time. First, cook the main ingredients going into the burger: quinoa, mushrooms, and zucchini. You really have to cook veggies before you add them to veggie burgers in order to get the liquid out of them. 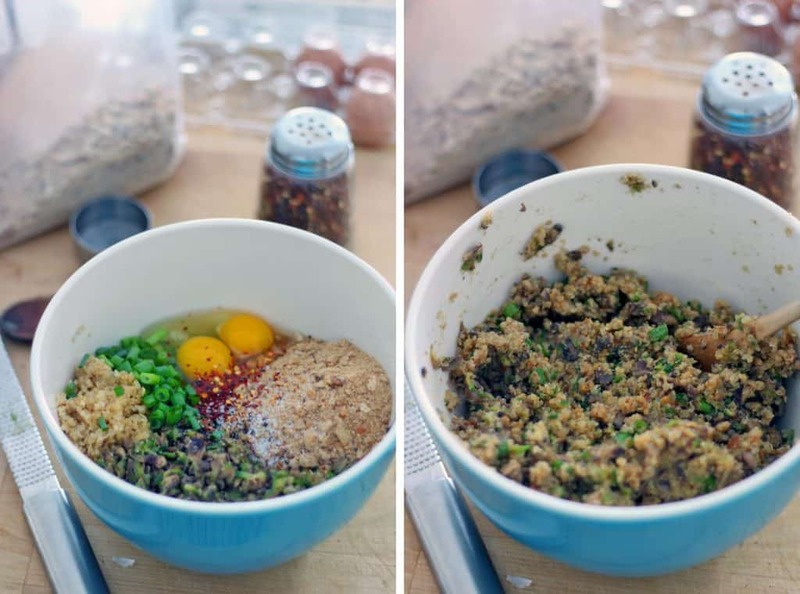 Then, mix them with some spices, an egg to bind it together, and some bread crumbs (I make my own whole wheat bread crumbs with toasted whole wheat bread in my food processor) to soak up the liquid. THEN, form patties, fry them, and bake them. Really, it’s not that complicated… it just takes some time. Totally worth it. I’m always looking for new veggie burger recipes. 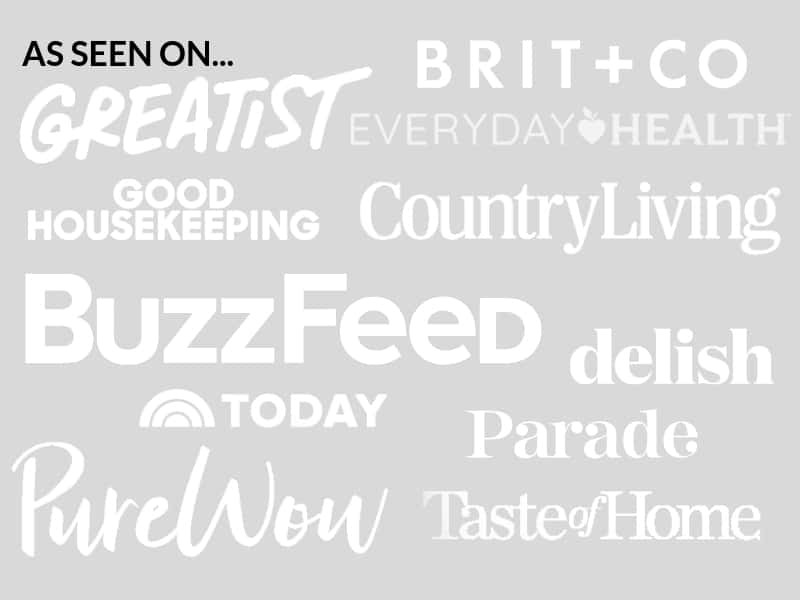 What are your favorites? Leave them in the comments below! 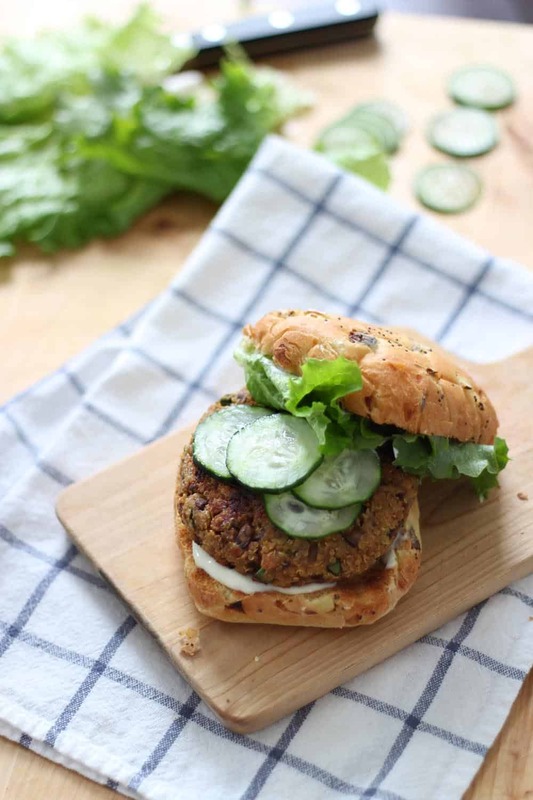 These Quinoa, Mushroom, and Zucchini veggie burgers are fresh and healthy! Plus, the secret to the perfect homemade veggie burgers that don't fall apart. Make a bunch and freeze the leftovers! 1 tablespoon olive oil plus more for frying. 1/2 teaspoon crushed red pepper or more, if you like spicy! 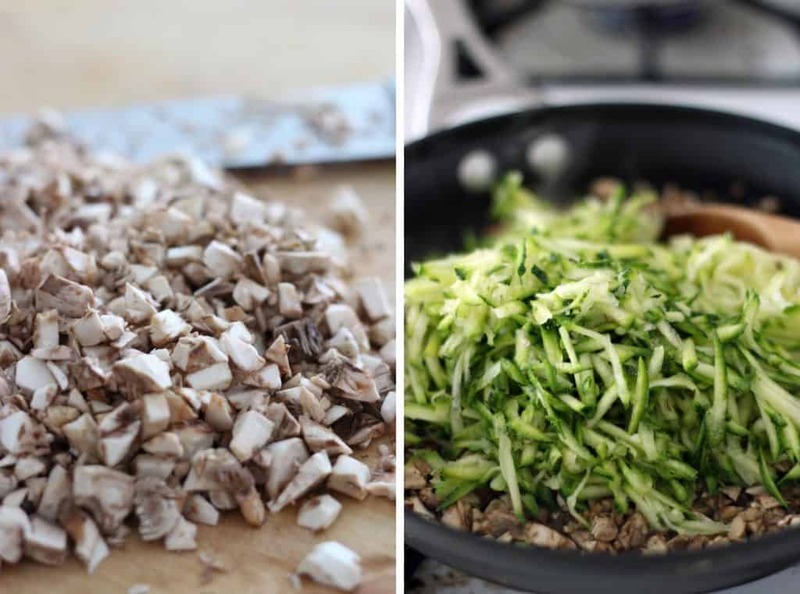 Saute mushrooms and zucchini in 1 tablespoon olive oil with a generous pinch of salt over medium-high heat. Stir only once in the beginning, and allow liquid from vegetables to evaporate. Continue cooking until vegetables are tender and most of the liquid has evaporated. Mix cooked quinoa, vegetables, and remaining ingredients in a medium-sized bowl. Form 6-8 patties with the mixture and fry over medium-high heat in 2 tablespoons of olive oil in a nonstick skillet. Cook for 2-4 minutes on each side, or until browned. Move patties to parchment covered baking sheet. Bake at 375 degrees for 20 minutes. If the mixture seems too sticky and won't hold together, try either adding more breadcrumbs or refrigerating the mixture for a couple of hours before forming the patties.